A Proof of Presence or Patrol Management System provides an accurate means to check and record the exact time that a member of Staff or a Security Guard is at a certain point and once there, if required report an action. Are your security personal patrolling your location when instructed, and at regular intervals? Provide reports on whether the Fire Doors are operational and areas clear. Reporting whether your Fire Extinguishers, Smoke Alarms, Fire Blankets are maintained and fully functioning. Provide accurate details on when and where areas have been cleaned and spillages being attended to, helping to avoid fraudulent injury claims. Providing an electronic report of when a relative is being checked, and any action taken to ensure their wellbeing. Hand written, or typed reports are not only time consuming but do not provide proof that duties have been carried out at an exact time. What type of Patrol Management System would best meet your requirements? Is it an external or internal location? Do you need to report an action once your operative has reached a checkpoint? Do you only need to view all your reports locally? Do you wish to obtain your reports from anywhere via The Cloud? Do you require Real Time report information, such as Man Down? Look for a Company that specialises in this field. They will guide you to the system that will best provide the solution to meet your needs. 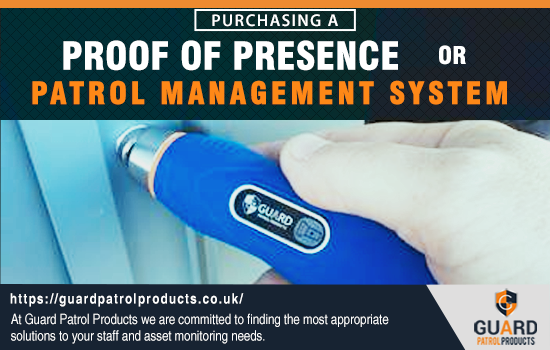 Once you have purchased a Patrol Management System you need to have the peace of mind that you will receive the level support that you would expect. Ask your supplier about the length of Warranty. Is training provided during set up and in the future. Does your chosen supplier offer local support and a UK service and maintenance centre. Can they provide a full remote IT support service.